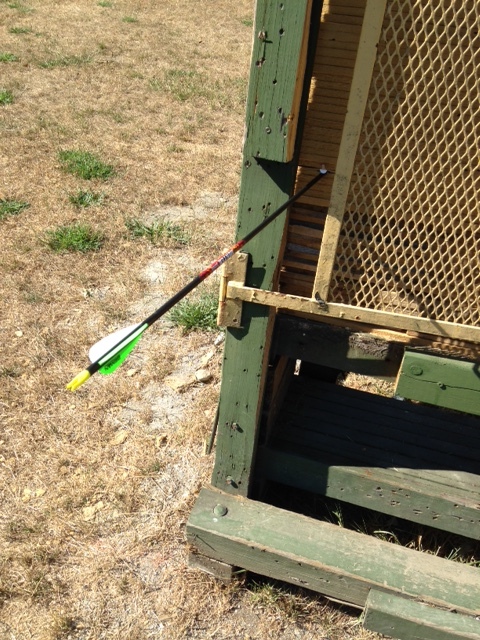 Yesterday, I went shooting with my own bow for the first time. My bow is a Rakim Wildcat, an 18lb recurve that I can't help thinking of as being only for complete archery beginners, but it's a very nice, serviceable weapon to get trained up. For my pains, I got a giant, red, already-turning-weird-colors bruise on the inside of my forearm. I slapped my arm with the bowstring twice, and the bracer I was wearing just happened to not cover that part of it. So mistakes were made, more or less. I attempted to pull a friend's 40lb bow, and immediately regretted it. I am shocked - SHOCKED I TELL YOU - at how much muscle I've lost in just a few months of being pregnant and not being able to exercise. But I managed over an hour of straight shooting with the Wildcat, and today I don't feel like my shoulders are about to fall off! In fact, I feel more or less okay! It was fun, oh man. Lots and lots of fun. It's tricky and somewhat technical and safety is a HUGE part of it, but it's excellent fun. I'm lucky enough that the friend I shoot with is an archery instructor who constantly corrects my form (and if I'd been paying more attention, perhaps I wouldn't have a giant bruise now!) but even if you're shooting alone, it's quite hard to shake the feeling that you should be wearing an elvish cloak and nailing orcs through the head while Aragorn hacks their heads off. I really can't recommend it enough if you want to feel like a total badass and swinging a sword is a little too tough. One thing that really stands out for me is the way I could actually see the archer's paradox in action. The paradox, simply speaking, is when the arrow seems like it shouldn't fly straight at full draw, but it does because it flexes in flight around the bow. It really messed with my head because it seemed to make aiming the arrow impossible. On the last few shots, I started to figure out that I should be aiming from the bow, not along the arrow - does that make sense? That might not make sense. I also picked up a quiver and a couple of arrows, and a stringer, and some wax for the bow stringer itself. Although I've been drooling over various traditional horse bows that I can shoot with either hand, they start at about 30lbs and I don't think I can pull that yet. I have to stick to the Wildcat until I get serious. So, on top of being a swordfighter, I can now work up to calling myself an archer as well. As soon as I can nail three bullseyes in a row, I'll buy myself a T-shirt saying 'Legolas is my homie'.